The Arizona Game and Fish Department’s Development Branch/Water Development Section is responsible for a large number of wildlife water developments/catchments throughout the state. These developments primarily provide water to wildlife during the hot dry summer months when water is scarce, although many wildlife species use these water sources throughout the year. Water Development Section responsibilities include redeveloping existing developments that are in disrepair, building new developments when warranted, and hauling water and performing routine maintenance on these facilities. 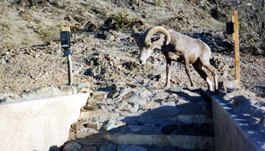 Since assembling the first “Arizona guzzler” in 1946, the Department has constructed more than 850 wildlife water developments statewide. 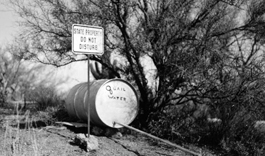 The first water developments were designed to support desert quail and upland game bird reintroduction efforts in the 1950s and early 1960s. An evaluation of the water development program in the mid-1960s redirected the Department’s focus from game birds to big game species. Over the last five decades, water development design, site selection, materials, and construction methods have continued to evolve as materials have become more environmentally safe and resilient, and dependable. Please refer to our Wildlife Water Development Standards for the latest design information. Other projects that the Water Development Section works on throughout the year are Apache Trout fences and fish barriers in the White Mountains, and wildlife area fencing throughout the state. Two new ideas that have recently materialized in the Water Development Section are the Adopt-A-Catchment program and a toll free phone line 866 950-AGFD (2433) that allows the public to report on wildlife water development concerns like low water levels or maintenance needs. The Adopt-A-Catchment program employs volunteers working through the Department’s Wildlife Managers on specific developments that the volunteers have an interest in, whether from a hunting perspective or a watchable wildlife interest. 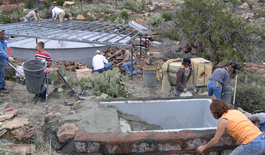 Some volunteers have even adopted more than one development since the program started. By adopting a development/catchment, volunteers are asked to regularly check water levels during the critical dry months and to perform some light maintenance like fence repairs or cleaning out collection points and gutters.